Port Sets are handy, predefined groupings of one or more ports that can be re-used and deployed across multiple Application Rules and Global Rules. HTTP Ports: 80, 443 and 8080. These are the default ports for http traffic. Your Internet browser uses this ports to connect to the Internet and other networks. POP3/SMTP Ports: 110, 25, 143, 995, 465 and 587. 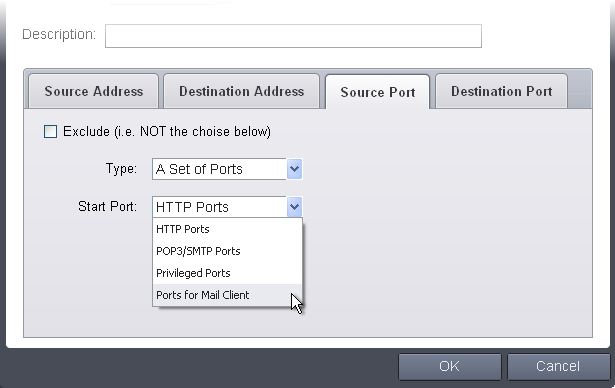 These are the ports that are typically used by mail clients like Outlook Express and WinMail for communication using the POP3, SMTP and IMAP protocols. Privileged Ports: 0-1023. This set can be deployed if you wish to create a rule that allows or blocks access to the privileged port range of 0-1023. Privileged ports are so called because it is usually desirable to prevent users from running services on these ports. Network admins usually reserve or prohibit the use of these ports. You can create new portsets and allow access to them for applications, with the access privileges specified through Application Rule interface. Refer to 'Creating or Modifying Firewall Rulesets' for more details. Click the handle from the bottom center of the Portsets interface and select 'Add' from the options. The 'Edit Portset' dialog will open. Enter a name for the new portset in the Name field. 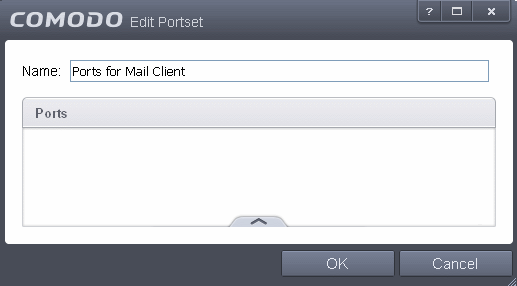 To add ports to the new portset, click the handle from the bottom center and choose Add from the 'Edit Portset' dialog. Exclude (i.e. NOT the choice below): The opposite of what you specify is applicable. 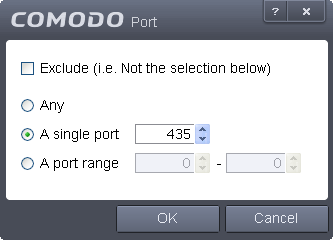 Click 'OK' in the 'Port' dialog. The ports will be added to the new portset in the 'Edit Portset' interface. Click 'OK' in the 'Edit Portsets' interface to create the new portset. Select the portset from the 'Portsets' interface, click the handle from the bottom center and select the 'Edit' from the options to bring up the 'Edit Portset' dialog. The editing procedure is similar to adding the portset explained above.